A new environmental chamber constructed by the Materials Science Division at Argonne allows researchers to watch materials as they grow step-by-step while interacting in elevated-temperature, reactive-gas environments. Engineers at the UCLA Henry Samueli School of Engineering and Applied Science are announcing a critical new breakthrough in semiconductor spin-wave research. University of Wisconsin-Madison mechanical engineers have developed a method for fabricating packages of tiny sensors that measure temperature more accurately than bulk thermocouples. Inserted unobtrusively in critical locations, these metal-embedded micro-thin film thermocouples could more effectively monitor conditions and diagnose problems during manufacturing processes such as injection-molding or die-casting. Scientists from Philips Research and the University of Groningen (the Netherlands) have for the first time fabricated arrays of molecular diodes on standard substrates with high yields. IBM researchers have demonstrated a new nanoscale method that both rapidly separates very small numbers of molecules and also delivers them precisely onto surfaces with unprecedented control. T-rays show a strange tendency to travel slower if they are sent down smaller metal wires. Engineers have created carpets made of tiny cylinders called carbon nanotubes to enhance the flow of heat at a critical point where computer chips connect to cooling devices called heat sinks, promising to help keep future chips from overheating. Using polymer-coated quantum dots targeted to a molecule found on newly growing blood vessels, a team at the Stanford University has shown for the first time that quantum dots can image the blood supply of a tumor. By growing polymers on a porous aluminum oxide template, researchers at the Seoul National University in Korea have fabricated polymer nanotubes to which they can attach two different types of molecules. 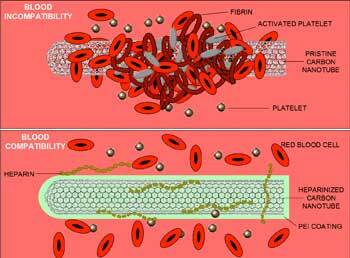 In a mixing of pasta metaphors, Pacific Northwest National Laboratory scientists have used electrostatic attraction to layer reactive biological molecules lasagna-like around spaghetti-like carbon nanotubes. Excessive moisture can typically wreak havoc on electronic devices, but now researchers have demonstrated that a little water can help create ultra-dense storage systems for computers and electronics. Detecting cancer and reinventing computing are two challenges that seemingly have little, if anything, to do with each other. A Stanford researchers thinks differently. Nanotechnology may one day help physicians detect the very earliest stages of serious diseases like cancer, a new study suggests. It would do so by improving the quality of images produced by one of the most common medical diagnostic tools, the ultrasound machine.